KAWAIHAE, Hawaiʻi - The improvements at the busy intersection were designed to improve safety for those traveling on the critical West Hawaii routes, state officials say. (BIVN) – The Queen Kaʻahumanu Highway and Kawaihae Road intersection improvement project is substantially completed, the Hawaiʻi Department of Transportation announced on Friday. All that remains are a few punchlist items to close out the project, but they “will be worked with minimal disruption to travel lanes and should be completed by Nov. 30, 2018,” DOT says. The estimated the $1.5 million project was initially supposed to be completed in August 2018, but “utility relocations, lane closure restrictions, and lead times for materials resulted in a revised completion target of late 2018,” the state says. 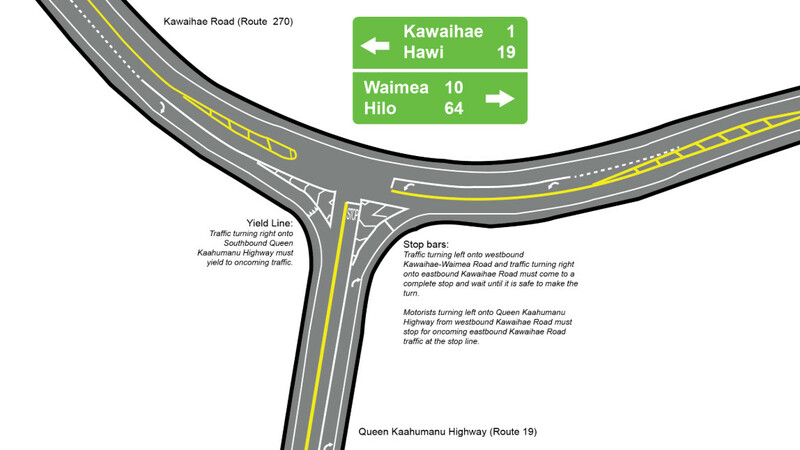 The project, which began construction in March, widened the intersection of Queen Kaahumanu Highway and Kawaihae Road to improve safety and allow for addition of a right-turn lane from Queen Kaahumanu Highway onto eastbound Kawaihae Road and a lengthened left-turn storage lane for westbound Kawaihae Road traffic. Safety improvements were also made to the nearby guardrails and culvert. “This was a top-of-mind project for many Kawaihae, Kohala, and Waimea residents. The widening of the intersection and addition of storage lanes should help make these crucial routes safer for people on their daily commutes,” added Senator Lorraine Inouye, who provided support for the project as chair of the Senate Transportation Committee.